The Horse and Farrier, Threlkeld is a Grade II listed 15th Century Country Inn with 9 bedrooms. 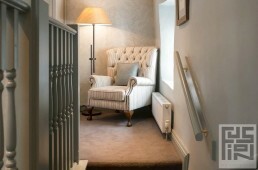 Full of character and set in the Northern Lakes nestled at the foot of Blencathra fell top. Popular with locals, tourists and walkers our brief was to bring some love and attention to this listed building. A full refurbishment of the property was required, extending into the adjacent cottage to bring this into part of the pub and hotel facilities. The ground floor pub and dining room were all fully transformed along with all nine guestrooms to the first floor. The client wished to bring some charm and character to the interior, reflecting the warm welcome offered in this long standing venue. The conversion of the cottage into the pubs footprint has provided additional dining space on the ground floor and has allowed us to develop a large family suite room as part of the hotel offering. 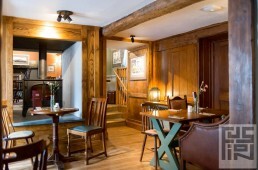 Golden oak and natural stone feature in the ground floor pub and dining room. With fern green tones and touches of wool and tartan upholstery fabrics which, alongside the wood burning stoves, bring a true country charm to the interior. 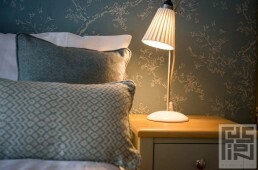 The guestrooms have a fresher colour palette with soft duck-egg coloured upholstered headboards and real wool throws. The ensuites to every guestroom have seen the greatest transformation, all fully re-tiled in a soft green tile, the largest of the guestrooms feature a bespoke double basins with classic styled fixtures and fittings to compliment the scheme.